Royole is an OEM whose main claim to fame is that it released the first ever flexible smartphone. It is bringing this product to CES, alongside others that, as the company claims, include electronics-enhanced clothing, a "smart writing pad" and more flexible displays. Royole asserts that the latter are ready for production. Royole, the company that gave us the world’s first flexible smartphone (presumably for the sake of being the one to give us the world’s first flexible smartphone), will have a booth at CES 2019, in order to showcase it and other products based on fully flexible hardware at the marquee event. 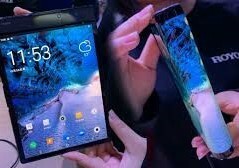 Therefore, in addition to the foldable mobile device, Royole has stated that it will be bringing an electronic writing pad, as well as a shirt and a top hat based on this next-gen technology. Royole’s take on foldable and wearable circuitry is termed the Flexible+ platform by the OEM. The company asserts that it will facilitate a revolution in the way its customers interact with, use and wear electronics, as well as how they will use them in the real world. Therefore, it is bringing some of its non-traditional-device products with Flexible+ technology to CES. However, the company is also bringing its “thin, lightweight, and bendable” displays to the exhibition. Royole’s displays, like its smartphone, are termed FlexPai. They are described as high-resolution, highly saturated screens for new and unique applications. The company claims that they are already being manufactured at its “mass production campus” in Shenzhen. Therefore, it seems that Royole, which has its origins in institutions such as Stanford, is setting itself up as a player to be reckoned with in the flexible-tech arena.